I took a day off following the New River Birding and Nature Festival; I’d been on the road a week, traveling and meeting people and talking, and though I’d been enjoying myself, I really needed a day to recharge my batteries. I’m an introvert by nature, and since I work from home my normal social exposure is a trip in to town for groceries and a new library book; so many people wears me down after a while. My next stop was in northeastern West Virginia and I decided to aim for nearby Elkins, WV, as my destination for the night. Since I was in no rush to get there, not having an event that evening, I took the advice of Opossum Creek Retreat owner/manager and NRBNF organizer Geoff Heeter to stop at the Cranberry Glades Botanical Area along my way. This is the location of one of the festival’s all-day trips. It’s a specialty destination, a rare habitat for the region. 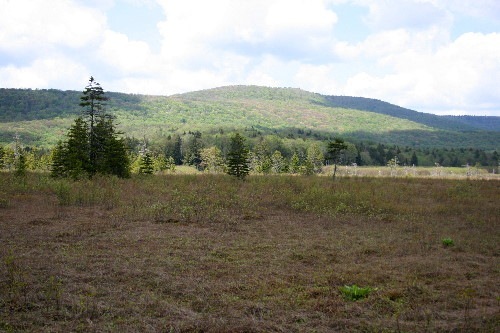 Bogs are typically a more northern phenomenon, where the ideal conditions occur (poor drainage, usually through non-porous bedrock; cooler temperatures; moderate precipitation) to form the acidic wet environments. 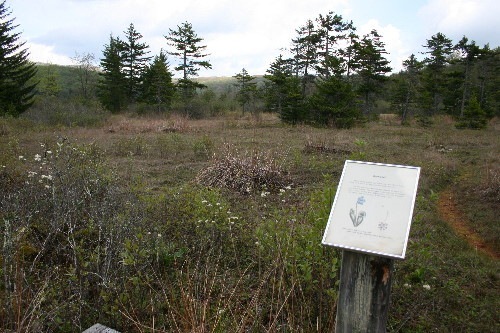 This collection of bogs in West Virginia represents some of the most southernmost in North America, and is West Virginia’s largest. In fact, it was probably the largest bog that I’ve personally had a chance to visit. The whole botanical area covers 750 acres, but the bogs themselves collectively measure 115 acres; the largest is 59 acres. The ones I’ve been to before have all been just a couple to perhaps a couple dozen acres. Up near Ottawa, ON, is the Alfred Bog which covers about 10,000 acres, but I’ve never been to it. 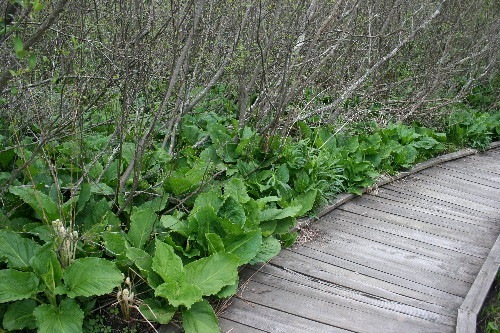 There are two hiking trails through the botanical area; one is 6 miles (9.7 km) long, which was a little more than I had time or interest for, but the other was a 1/2 mile (800 m) boardwalk that passed along the edges of two of the bogs as well as through some wooded sections. Given how much I dawdle over things, I figured that’d be plenty long enough and still allow me to see a lot. The name of the place highlights one of the most common species there. The cranberries were pretty much everywhere, but the plants are so small and inconspicuous that you really had to look closely to see them. They’re more obvious once the berries form and ripen. 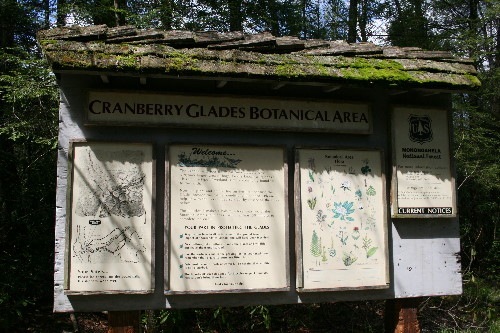 Cranberries are mostly associated with boggy, acidic environments, though some cultivars have been developed that can do just fine in normal soils. There were also the other expected bog plants there, including the two carnivorous species, pitcher plant and sundew. I only spotted a few pitcher plants, not blooming yet, and while I looked for sundew I didn’t see any. It could have been too early yet for them to be very large; like most non-woody plants they die back and grow anew each year. I only noticed the sundews in our little poor fen at the back of our property perhaps a couple of weeks ago. These plants were something of a highlight for me. Although by the time I visited they were well past their most identifiable stage, I was happy to see these Skunk Cabbage. It’s a species I’ve never yet encountered, as finding them in the spring when they’re just starting to peek through the snow requires a combination of luck and knowing where to look, and I’m not aware of any plants in our immediate vicinity. These don’t grow in the bog proper but rather at the bog’s edge, where there’s actual soil to grow in (rather than the peat covering that many bog specialists grow in/on). By this stage of their growth they’ve lost the distinctive odour that gives them their name (that’s used to draw insects in to their very early flowers). This was another plant I discovered there that I’d long been wanting to see. 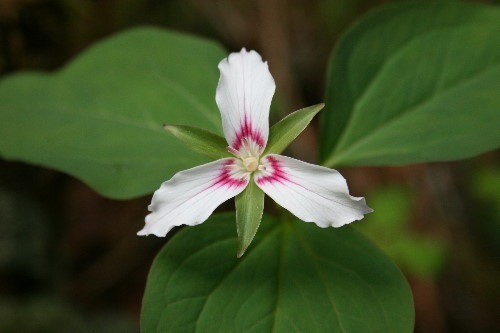 It’s a Painted Trillium, and the pink chevrons of the species are beautiful and distinctive. These weren’t in the actual bog either but rather in the drier forest habitat surrounding it. However, it’s perhaps no surprise they were there – they prefer more acidic soils, and away from bogs/fens are typically associated with trees such as evergreens and Red Maple that acidify the soil beneath them with their dropped needles/leaves. It is in fact found in Ontario, but I’ve never seen it here (never been in the right environments at the right time of year, I guess). There were lots of birds there, even by the time I arrived around lunchtime, so I can see why it was a popular destination for the NRBNF. There were many species I hadn’t seen since the previous summer. Blackburnian Warblers were extremely common, and I saw a few Canada Warblers as well. While the Blackburnians remained up higher in the evergreens the Canadas foraged at eye-level. This was the only wildlife photo I got (and a crappy one at that; while I have a long lens for my camera I’d naturally left it in the car, so this was taken through my binoculars), despite the abundance of birds; most were more readily heard than seen. 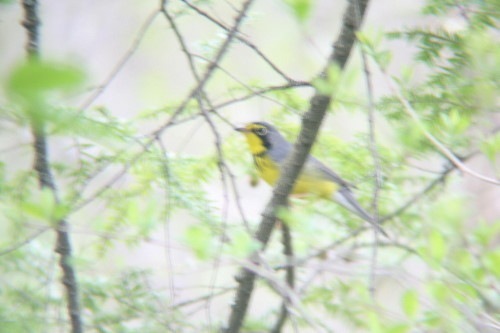 Canada Warblers are a recent addition to the Canadian Species At Risk act, and are not surprisingly relatively uncommon. Nearly all of the individuals I’ve seen over the years have been through bird banding, when we’ve caught them in the net. It wasn’t an especially long drive to Elkins from Fayetteville, but it was nice to stop and stretch the legs a bit and get out to do some nature-watching in an interesting place. Not to say that the New River area wasn’t interesting, but there was lots of it and I was there a few days. I’m sure you know what I mean. Next up: Canaan Valley NWR, Ned Smith Center for Nature and Art, and the Ashland Nature Center. One of the nicest things about living at this property, I think, has been the bluebirds that have reliably nested in the box in the meadow a hundred meters back from the house. It’s probably the same pair returning each year; the birds can live up to 7 or 8 years or more and tend to be fairly loyal to their territories. Last week Dan and I went out to check on how the local family was doing. Although by the time I go out with the dogs in the afternoon things have mostly quieted down, Dan’s been watching them during his morning walks and he had a feeling they’d be getting close to fledging, which they do at this latitude at about 19 days old. Sure enough, when we opened up the box the little guys were probably only a few days away from leaving the nest, if that. Fortunately, they weren’t quite ready to go yet, and just hunkered down when I reached in to count them and pull them out for a photo. 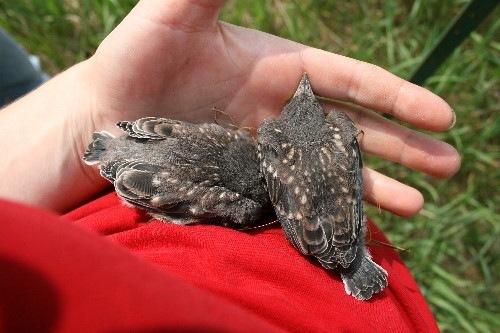 Their feet, one of the first parts of a baby bird to mature so they can use them to cling to branches if they have to leave the nest early in an emergency, gripped at the nest as I picked them up, and then at my hand while I held them. The photo above is of a baby boy. 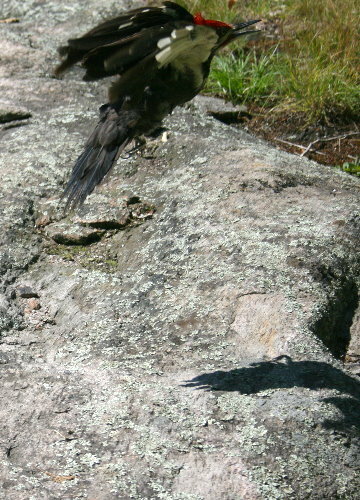 You can tell the sexes of the babies apart by the colour of the wing and tail feathers – blue in males, grayish in females (below). We had two of each in the box. While we had the box open the parents sat in a nearby tree and waited. They were pretty patient with us for most of it, having come to recognize Dan as no threat from his morning walks and occasional checks. For temperate migrants like these guys, who spend the winter not that far south of here, the breeding season starts early and many are already fledging young. Meanwhile, tropical migrants such as many of the warblers are only just starting to establish territories and build nests. 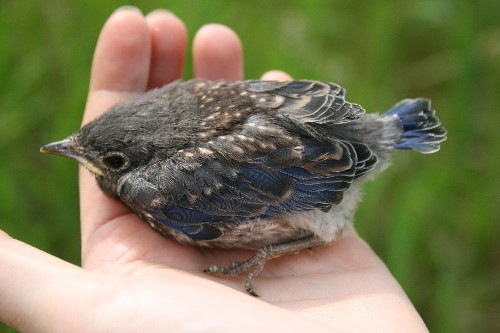 We’ll be starting our MAPS visits this week and will get to see a lot more baby birds in the next little while. I do look forward to the fieldwork, for that and other reasons. It’s too bad it requires getting up so early! Although it’s probably the first moth of the year that I look forward to most as far as signs of spring go, it’s definitely the return of the first avian migrants that marks the arrival of the season for me. In particular, Red-winged Blackbirds. Where I grew up there was a small swampy wetland area at one corner of the property, and every spring the song of the Red-winged Blackbirds would ring out from that swamp just as the snow started getting mushy and the ground muddy. They’d show up at the seed scattered below the feeders, and would perch in the tree branches above the house. Even before I started paying attention to birds, their return was a sure sign of spring. The sound of a Red-wing singing immediately recalls memories of my childhood to my mind. The same warm front that enticed the first moth out of hiding last Wednesday brought with it the first Red-winged Blackbirds. They’d shown up at my mom’s, an hour or so south of us, last weekend so I knew it was just a matter of days before they arrived here. Red-wings, like all blackbirds, are diurnal migrants. 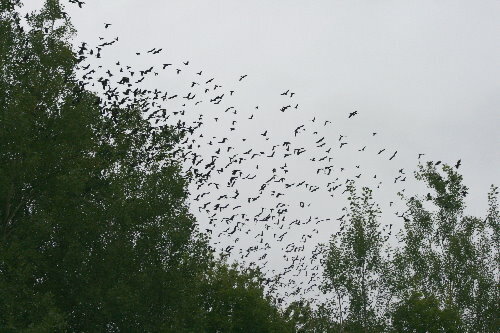 They roost, often in large flocks (especially in the fall), overnight and then move during the first half of the day. They put down by the afternoon so they have some time to forage before going to rest at night again. When I went out for my afternoon walk with the dogs on Wednesday, and all during it, I watched for Red-wings without seeing any. It was only upon returning to the house that I heard the distinctive chuck of a Red-wing in the trees by the feeders (the photo above is a record shot of that bird). Spring has officially arrived. The next day, Thursday, we got our first grackle. I have no similar associations of grackles with spring, other than that they’re usually on the tail of the Red-wings (who nearly always arrive first by a few days). Just the one so far, that I’ve noticed. On Saturday, Dan spotted a pair of Pine Siskins at our feeder, and today, a Purple Finch. Dan said he’s seen siskins around all winter, in low numbers, but they must hunker down by the time I’m out for my walk with the dogs in the afternoon; I haven’t seen one since December. Ditto on the Purple Finch. 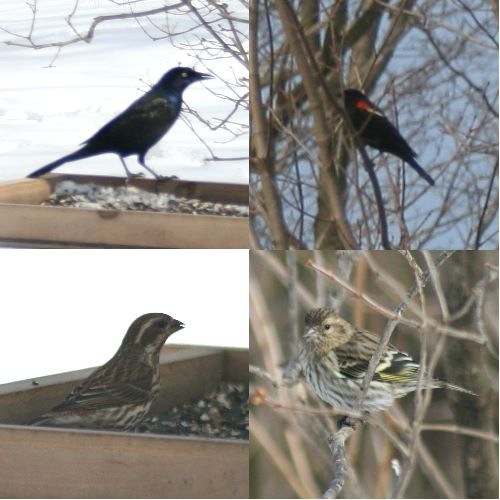 All of these birds are temperate migrants, moving a short distance south of their breeding range to slightly milder regions – though not necessarily a whole lot milder, as some blackbirds and grackles do spend the winter in Ontario, along the shores of the lower Great Lakes. The siskins and finches winter around here, but many travel farther south, beyond our border; their movements aren’t really migrations proper as they’re more food dependent and vary from year to year, but they often follow similar timing when they happen. The individuals we saw this weekend may represent some of these returning, rather than locals, though we can’t really tell. As far as the two blackbird species, the timing of their return tends to be with the first warm fronts that bring spring-like temperatures to a region. They can get by on seed, but they’re also insect-eaters when there’s insects to be had. If you see Red-winged Blackbirds sticking their bills into cattail heads, for instance, they’re actually looking for small moth caterpillars that spend the winter there, rather than gathering fluff or eating the seeds. I don’t have a photo of the first Red-wing from last year, but the first grackle seems to have showed up on March 21 (or at least, I have seven photos of a grackle from that day, and I pretty much never photograph grackles except the first one to arrive because it’s so exciting). So it might be he’s a little ahead of schedule. The date I have in my head for the arrival of Red-wings is March 15. This is carried over from my home where I grew up, too, which is more southern than where I live now. I don’t really have any data to back this notion up, but it does seem to me that the blackbirds being back already is earlier than normal. That first one last week was on March 7. There is some concern about climate change causing the timing and pattern of bird migration to shift. 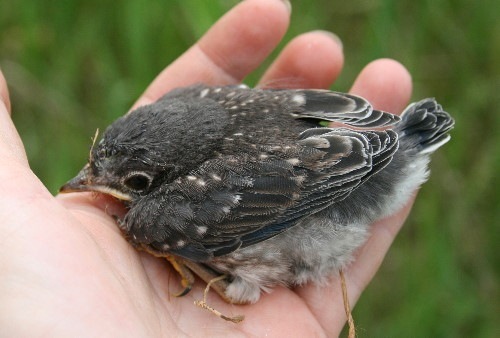 Many birds use temperature cues rather than day length to know when to migrate. Before humans arrived on the scene, birds and the food they depend on had evolved together so that everybody’s life cycles were all carefully timed. Birds would arrive back from migration timed just right to be able to set up territories, build nests and incubate eggs so that the insect population that they depend on to feed their nestlings peaked just as the eggs started hatching. Early nesters who come back too soon because they’ve been fooled by abnormal weather patterns risk their own survival (should the weather turn foul again – this is especially dire for birds like swallows that catch their food on the wing) and/or that of their nestlings (if there’s not enough food available yet when they hatch). My mom posted about this and talks about it in a little more detail. She also includes a link to a CBC radio broadcast on the topic, which happens to interview some Canadian birders and biologists I know personally. Worth a listen if you’re interested. When Dan came inside a couple of days ago he told me, “There’s a blog post for you over by the shed. All over the snow.” Figuring there’d been a predation out there and I’d had a murder scene to dissect, I grabbed my camera and went out to investigate. 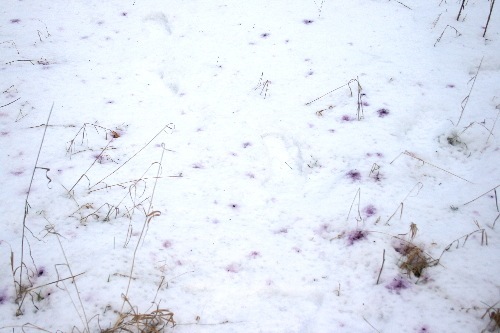 But instead of finding fur or feathers, I found… purple stains? 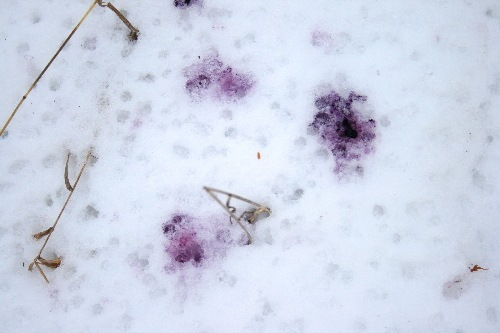 The stains, of course, are the waxwings’ droppings, dyed purple by the berries they’d been eating. There aren’t a lot of purple berries available at this time of year; wild grapes and buckthorn would be the primary candidates. At the centre of most of the stains was either a bit of berry skin or some seeds, so I took a closer look to try to determine what they were eating. It doesn’t help that wild grapes and buckthorn berries are both roughly the same size, especially after having passed through a digestive system. I took a photo of the bits, with my fingers for scale, figuring I’d try to look them up. I first tried googling buckthorn berry seeds to see if I could find any images to confirm that’s what this was – I know what domesticated grape seeds look like, but don’t know if the wild type look the same, and I’ve never opened up a buckthorn berry. When that turned up nothing, I thought, you know, the easiest way to confirm this would be just to go get a buckthorn berry and see. I write most of my blog posts in the evenings or, often, late at night. So this thought occurred to me at about 11:30 pm. After some minutes of weighing it in my mind, I finally decided that yes, in the interest of completeness, I’d venture out and find a buckthorn berry. Just to be sure. I bundled up, grabbed a flashlight, and called to Raven. (Perhaps strangely for someone whose primary interest is a nocturnal taxon, I’m somewhat afraid of the dark. Fortunately, all the snow in the winter means it never gets really dark at night.) We ventured out to the one location on the property where I knew there were some buckthorn. The shrub was mostly empty, but a few lone berries remained. Upon returning to the house with one, after stripping off all my winter garb again, I broke it apart on a kitchen plate. 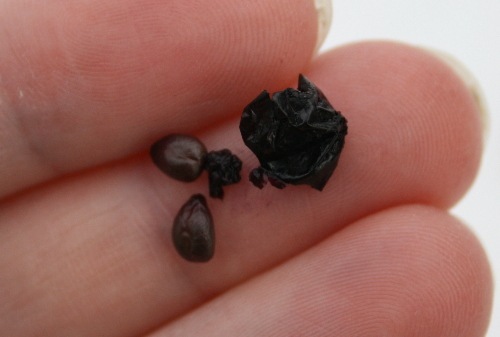 Inside the thin skin were four blunt-ended teardrop-shaped seeds that looked exactly like the ones in the droppings. Combined with the fact that the buckthorn shrub had been cleaned out, I’m pretty confident in saying that that’s what the birds have been eating. Edit: Super-smart bird-poop expert Julie Craves comments that these are probably, in fact, wild grapes. D’oh! Check out her explanation in the comments for why. I blogged about buckthorn a little over a year ago, and commented on its potential benefits to wildlife. It’s kind of nice to see our local wildlife making use of an invasive plant like this, especially since it’s one of those species that’s been so successful there’s probably little hope of eradicating it anymore. I’ve spent most of the last week away from home, making my usual travels about Ontario. The morning that I left I got up unusually early (for me) and headed straight for the shower. When I got out I noticed a lot of chatter outside the washroom window. A few dark shapes swooped by, from the trees opposite to someplace down below. The washroom overlooks our side yard, but you can see a little of the front lawn from there; and on our front lawn were dozens of blackbirds. I hurried for my camera, but naturally it was downstairs and had the wrong lens on it. By the time I got it swapped out and returned to the living room window, most of the birds had departed, leaving just a few dozen in front of the house. They hadn’t gone far, though, just to the woods at the far edge of the meadow, perhaps a hundred yards away. So I slipped on my shoes and headed out with my camera. I could hear them the moment I stepped outside. Blackbird flocks are remarkably noisy; it seems that every bird has something to say. Below their voices, though, was another sound. I might almost have guessed it for running water, if I didn’t know we didn’t live anywhere close to a burbling creek. I made my way through the dewy grass for the woods and peered through the branches. Sure enough: easily a hundred or more blackbirds, mostly grackles, shuffling through the leaf litter on the forest floor, the rustling of the dead leaves sounding like water. The forest birds represented only a portion of the flock. The rest of them were foraging among the grass at the field, or in the lower branches of the woods’ edge. A foraging flock of blackbirds seems to be constantly on the move. The whole time I stood there birds were flying along the edge of the trees, always in the same direction, dozens at a time. They’d fly out from the trees, or up from the ground, forward a few dozen yards, and then land again. The flock rolls along like this, the birds in the rear leapfrogging to the front and foraging for a while until they’re again at the back. It’s really neat to watch because it looks like the flock never ends, with birds constantly rising up and streaming forward. This was why the birds passed through our front yard so quickly. It makes it hard to get an accurate idea of flock size, too, but I guesstimated there were at least a few hundred in this one. 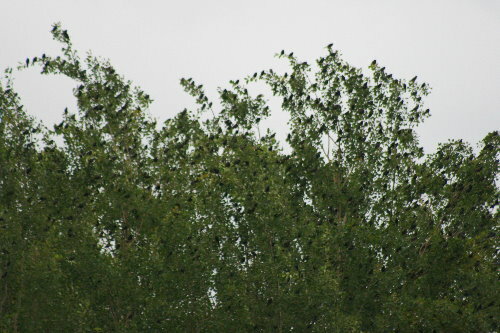 Interestingly, the day before there had been a large flock farther back in our fields, hanging out in the treetops. It might even have been the same one. Blackbird flocks are often heard before they’re seen, which was the case with this one. Hundreds of voices make enough din to carry fairly long distances. These groups may serve one of a few purposes: congregations of waterfowl or shorebirds are often tied to localized food resources, and Canada Geese and other formation-flying species will travel together for the decreased energy costs of flight. There may also be an element of safety in numbers involved. 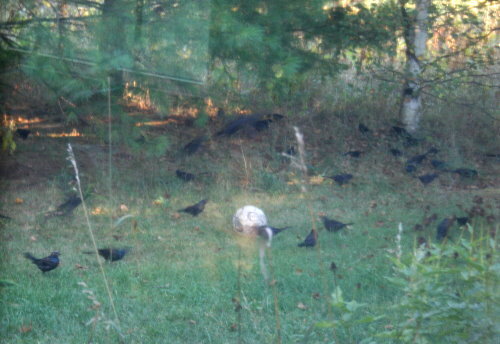 I’m not sure why blackbirds gather together in the fall. There aren’t very many species of passerines (songbirds such as the sparrows, warblers, blackbirds, etc) that will congregate like this; blackbirds (grackles, Red-wings, Rusties, cowbirds, and related) and starlings will flock together, as will swallows. Neither the Birds of North America account for Common Grackle nor that for Red-winged Blackbird make any suggestion as to why these species flock together in the fall, though both accounts note that they do. They’ll actually migrate, during the day, in large flocks like this (many if not most other passerines will migrate individually at night), so perhaps the flocking behaviour does provide for some safety in numbers from diurnal hunters such as hawks and falcons. Blackbirds remain in large mixed-species flocks through the winter, too, often numbering in the hundreds of thousands or more. The Birds of North America account for Red-wings notes that “Very large flocks may stretch for miles.” Needless to say, the flocks we observe up here during migration never get that large. The flock from that previous day wasn’t foraging the way the morning group was. Instead, they perched high in the treetops, talking loudly amongst themselves. At some unseen signal they lifted off together, swirling about and re-settling in some other tall trees farther into the forest. I suspect they were staging – preparing to depart south. I’m not sure why birds stage like this, either. Are they counting heads to make sure everyone’s present before they leave? Maybe they’re waiting for the appointed hour and these were the individuals to arrive so far (“The bus leaves at five, but try to show up early to make sure you don’t get left behind”)? Everyone hanging out while they do their warm-up stretches in preparation for the long flight? The noisy flocks are just another sign that summer’s drawn to a close. Soon, they’ll all be gone, nearly all of them for points south of the border, and we won’t see them again until March. A Pileated Woodpecker captured and banded at our Blue Lakes MAPS station this season – only the second we’ve caught in three seasons of MAPS work. It’s such a privilege to see these guys in the hand. This one was an after-third-year – that is, at least four (or more) years old. Close-up of the bird here. I’m halfway through a second post on the Frontenac Biothon, but kept letting myself get distracted by things and now it’s bedtime (well past, in fact!) so I’ll have to finish it up tomorrow. 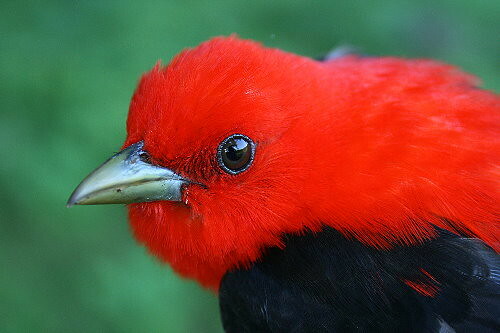 Instead, I’ll post this photo of a Scarlet Tanager. We caught this guy at our Maplewood Bog MAPS station last week. This gorgeous bird is, of course, a male. The females are always a greenish-yellow with brownish wings. In the fall males will also be greenish-yellow, but they’ll retain the black wing feathers of their summer plumage so it’s easy to tell them apart. This handsome fellow is an after-second-year individual (that is, he was hatched at least two years ago [2009 or earlier]; birds’ ages are labeled by calendar year, so birds hatched this summer are called “hatch-year”, those from last summer are “second-year”). You can tell second-year males from after-second-years by the blackness of the wings and the redness of the body – second-year birds will have browner wings and oranger body plumage. The after-second-years practically glow.